The dust storms can last from fifteen minutes to a couple hours. They make the air heavy and dusty, of course. 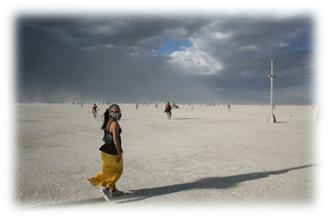 Walking on the playa during one may be extremely uncomfortable and even kind of dangerous without taking the minimal precautions. A simple paper face mask will do the trick or even an oxygen mask for the more neurotic types. It’s completely impossible to open your eyes with all that wind blowing from all directions, a pair of goggles is like a piece of heaven’s equipment for facing the dust storms, and it’s surely one of the number one items in all burner’s wardrobes. Your eyes can only see what your arms can reach, that means it’s a little hard to see something that’s further than one feet away from your face. It feels like walking in between a labyrinth of dust clouds. The security advice is not to drive during storms, park your bike and look for shelter. All that’s not protected will be hit by the 80km/h wind, and impregnated by all the dust it blows along the desert. But in spite of all the cons, walking around BRC during a dust storm for the first time is more exciting than watching Dorothy’s house being taken by a tornado in the Wizard of Oz. Also, the gracious dancing sand spirals, little dust devils, form themselves less than a couple feet away from you, and then disappear like magic after a few seconds. When the strong wind finally looses its breath, the blue sky begins to show from behind the dark clouds. Traces are left everywhere by this relentless force of nature, all camps are covered by a thick layer of playa, and there’s always someone running after something that was gone with the wind.